Welcome to another challenge from the Ribbon Carousel Blog! For this months RCC Challenge we would like you to use Washi Tape on your project. Continue reading below on how you can play along and enter to win a set of 12 spools, 4 spools will be filled with seam binding, baker's twine or May Arts ribbon! Inspiration for the challenge is posted every Tuesday Ribbon Carousel Blog! I created a Mixed Media card, adding the Washi Tape to my project in the layout, behind the stamped image and I also used the tape to create a flower embellishment. I used the Gelli Arts Plate along with stencils from Just a Trace to create the colored background panel. I adhered a few pieces of Washi Tape and a die cut panel to the background for interest, then add Molding Paste through a stencil for added texture and interest. The image is from the Artistic Outpost Think and Wonder plate, stamped in Black Archival on White card stock. I cut the image away from the background, sponged the edges and adhered it to the taped background. March 2nd, to add your creation to this post on the Ribbon Carousel Blog. One Random Challenge Participant will receive a set of 12 spools, 4 spools will be filled with seam binding, baker's twine or May Arts ribbon! The winner will be announced on March 3rd, on the Ribbon Carousel Blog! For more inspiration, click here to see the other DT Members projects for Week 1. Amazing card! I'm not a big washi gal, but you may have just pushed me over the hill! And prize, wow!, love the chance. Just gorgeous, Lisa! I always learn something new every time I visit your blog! Love how you used the washi tape here and of course all the interesting texture! Hugs! I love this - beautiful use of the washi tape, including on that brilliant flower... Just lovely! 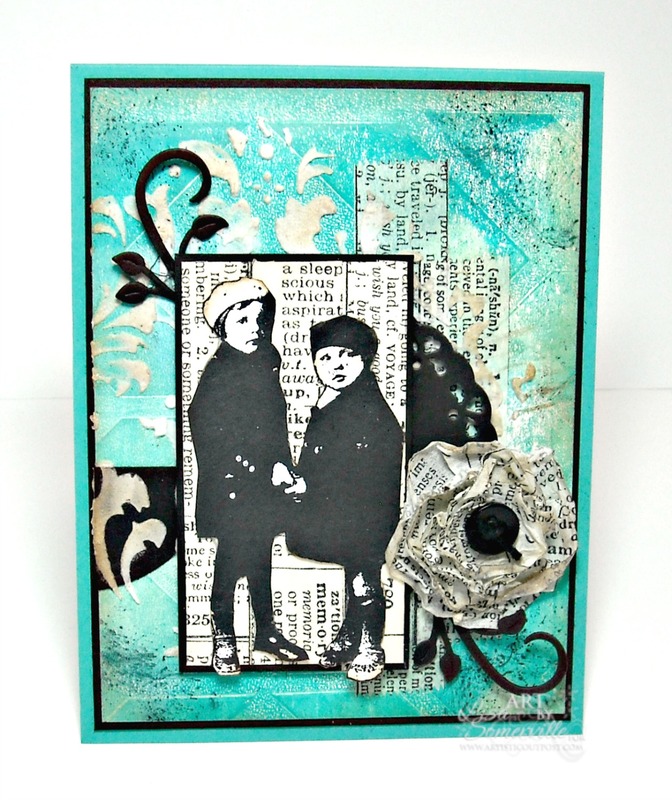 Love all the textures you used on this card and of course I adore that image!